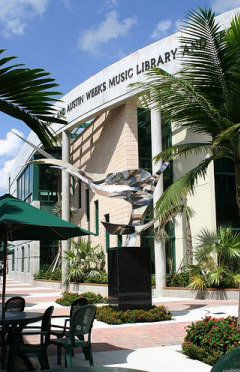 The Marta and Austin Weeks Music Library at the University of Miami Frost School of Music is a state-of-the-art facility with computer workstations, networked printers, copying equipment, listening stations, study carrels, instructional facilities, casual areas, and a collection that grows by more than 2300 items per year. We are fortunate that the librarians are able to acquire almost anything faculty and students need for their teaching and research. The music library alone holds over 26,000 books, 54,000 recordings, 76,000 scores, and 130 journal and periodical subscriptions. The main library on campus holds an additional two million volumes. Some highlights of the Special Collections include the Larry Taylor-Billy Matthews Musical Theater Archive (a comprehensive collection of materials relating to American Music theater and popular music), the Aldemaro Romero Collection, containing the original scores of the iconic Venezuelan composer, the David Ewen Collection (the library and papers of the prolific writer and editor noted for his research into U. S. musical theater and popular music), the Ramon S. Sabat (PANART) Collection (the papers and recordings by the Cuban musician and sound engineer who founded one of the first Latin American recording companies), and the Cuban Heritage Collection, comprising a vast collection of rare books, periodicals, maps, posters, photographs, manuscripts, maps, architectural drawings, prints, broadsides, sound recordings and other materials documenting Cuba, the Cuban exile experience, and the culture and literature of the Cuban diaspora.